This morning I’ve been living the stay-at-home mom’s dream. 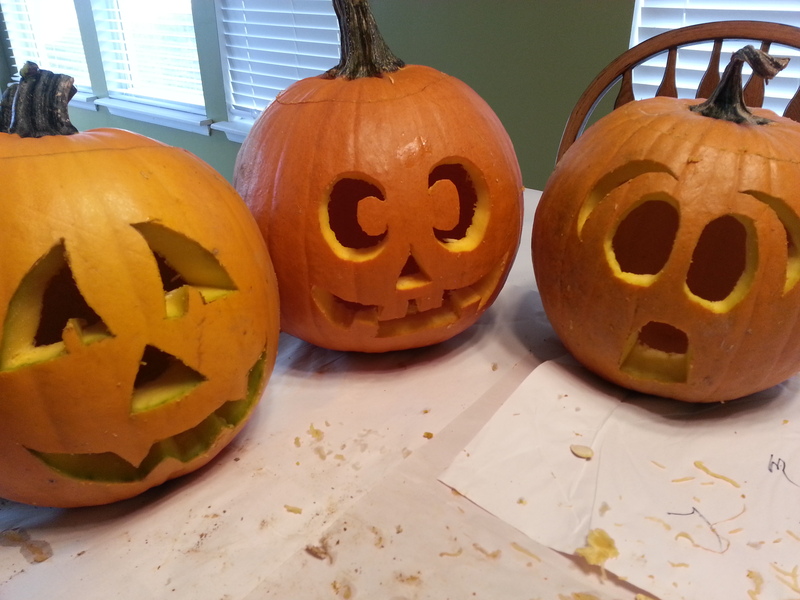 I took my children to school, covered my kitchen table in newspaper, and carved jack-o-lanterns. Okay, maybe it’s not every stay-at-home mom’s dream, or even mine, though I’m pretty sure my kids think I make them go to school just so I can play with their toys all day long. Remember when we were kids and we had to do this with just a spoon and a steak knife. And bandaids. I really did borrow their carving tools because I haven’t carved a pumpkin on my own since my oldest could manage to rub pumpkin guts in his hair, but tomorrow are the fall parties in my sons’ classrooms and while I did manage to dodge being put entirely in charge this time, I volunteered to help. And no fall party would be complete without a few Jack-o-lanterns, that bizarre Halloween craft that traces its roots back to a not-so-nice wandering spirit named “Stingy Jack.” According to an Irish tale, Jack was a ne’er-do-well who had a run-in with the devil, a much more famous ne’er-do-well. Because he was such a good guy, Jack invited the devil to join him for a drink. The devil agreed and even said he’d pay the bill when Jack suggested that the devil turn himself into a coin from which he could later transform back, thereby cheating the bar owner out of the price of the drinks. As soon as the devil transformed, Jack grabbed the coin and placed it in his own pouch next to a small cross he had presumably stolen from someone much nicer than himself. The devil was trapped and Jack only agreed to release him for a promise that he’d leave Jack his soul. 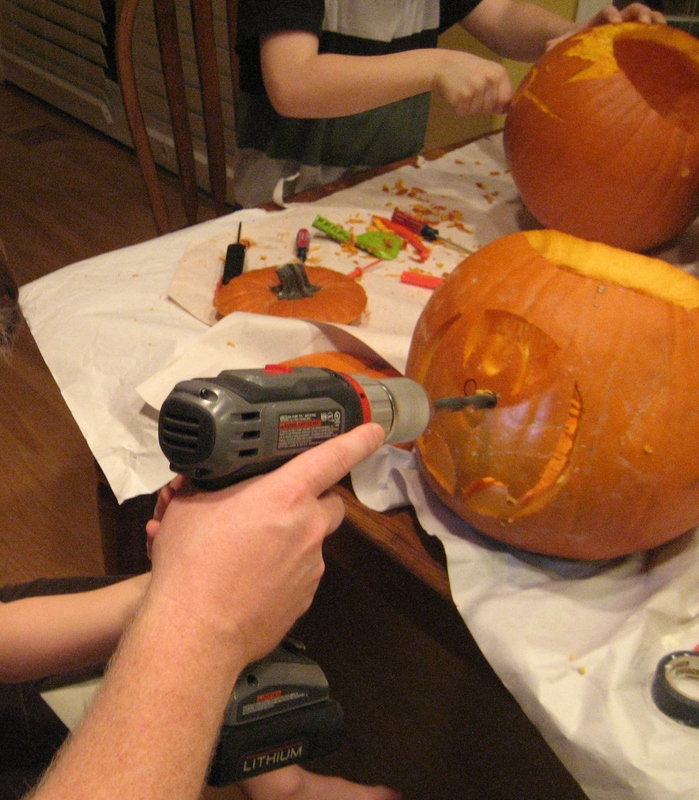 Don’t worry, my boys will get to carve they’re own pumpkins, too. They might even get to use Dad’s tools. Some versions of the tale claim that Jack trapped the devil in a tree with similar results, but regardless of how it happened, the years went by and Stingy Jack died, as nearly all ne’er-do-wells eventually do. Of course, because of his ne’er-do-well ways, Jack didn’t make the cut for Heaven. The devil wouldn’t take him in either and so Jack found himself stuck. Not knowing where to go, he asked his old drinking buddy for directions. In answer, the devil flashed him what I have to assume was truly a devilish grin and tossed Jack a burning ember from the eternal fires of Hell. So it turns out this story might not really address the history of today’s jack-o-lanterns at all. There’s not even much evidence that the tradition is particular Irish in origin. Jack’s story is similar to tales from around the globe, used to explain the ghostly phenomenon of ignis fatuus, or the eerie lights that sometimes appear at night over marshy areas and, like a newborn’s smile, are often attributed to gas. The Māori people of New Zealand were carving gourds to use as lanterns as early as 700 years ago, and it worked pretty well. On a night when little ghouls and goblins are running through the streets, it seems like a good idea to light their way. The practicality of the carved gourd as a way to see where one was going and ward off the evil of the night eventually merged with the spooky tale of Stingy Jack and the Jack-o-lantern we know and love was born, maybe as recently as the early 19th century. So today the jack-o-lantern is a staple of Halloween décor and of fourth grade classroom fall parties, where it’s featured in the “puking pumpkin” experiment. How could I not volunteer to help with that!? Uh oh. These pumpkins don’t look like they’re feeling so well. 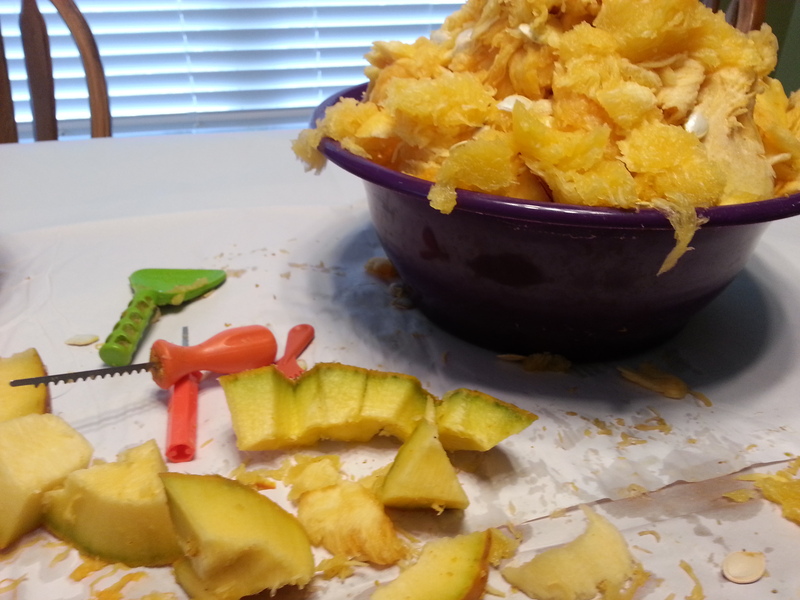 After the party tomorrow afternoon you can check out a video of the puking pumpkins on my Facebook page. Sarah’s comments are, indeed, a bit quirky. But always entertaining.